Primary source analysis promotes information literacy, a vital skill for competent citizens. When selecting primary sources to use with students, keep the criteria listed below in mind to ensure valuable learning experiences. Will your students want to dig deep, ask questions, and learn more about the primary source? Is the source relevant to a current unit or theme? What primary source type(s) will best engage students? Is the content of the primary source suitable for your students? Is the source too simple or too complex? Will the length of the primary source affect student comprehension? Would an excerpt be more appropriate than the source in its entirety? Is the vocabulary used in the primary source at an appropriate level? Will your students be able to decode the text or decipher the audio? Will outdated terms need to be defined? Will students be familiar with any of the people or personal, social, cultural, or political events happening around the time the primary source was created? Will students need to be introduced to certain information in order to interact successfully with the source? Note: You may choose to have students analyze primary sources specifically to gain a better understanding of student background knowledge on a particular topic. Are there clues within the primary source (not the bibliographic record) that will help students place the source into historical context? Will students be able to identify clothing or technology from a certain time period? Are the creator’s name and creation date available on the primary source or in the bibliographic record? Would additional information about the creator be useful when analyzing this source? Was the source created close to the time that it represents? How detailed is the bibliographic record? Does the bibliographic record provide historical context? When and what bibliographic information should you reveal to students? Will Library catalog notes or other markings distract students or interfere with their ability to place the source into historical context? Do your students need a source with a more descriptive bibliographic record to help with further research? Does the primary source provide enough clues to identify the intended audience and purpose (idea, agenda, etc.)? Is there evidence of a particular bias? Consider your own beliefs about a historical event or issue. By selecting a particular primary source, are you inadvertently presenting one point of view over another? If you plan to use an excerpt of a source, is the meaning of the entire source preserved? When using more than one primary source, have you selected items that present different perspectives? What types of sources will best help students construct knowledge? Will handwriting impact your students’ understanding? Is the image sharp and bright enough? Is the audio loud and clear enough? Does background noise interfere with spoken words? Note: Some digitized manuscripts and audio files from the Library’s collections are accompanied by transcripts. Although some consider transcripts a step removed from primary sources, transcripts are a tool that can make it easier to use certain sources with students. Are you able to zoom into details on the digitized primary source? Can your print out these details or is the primary source best used in its digital format? 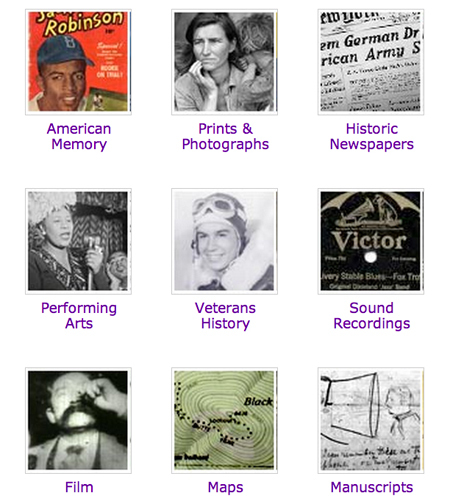 Are you using the highest quality primary source available on the Library’s website? Is the source clear enough for students to locate important details and make reflections about what’s happening? Note: Images on the Library website often have several file formats, including high resolution JPEG and TIFF files. Consider using a larger file type when projecting or printing out sources. For higher quality audio, use the WAV format. For higher quality video, use the MPEG format. What is the overall primary source activity or project goal? What problem are students trying to solve or what product are they trying to create? How will the primary source(s) be used (as the basis for class discussion, written reports, in-class presentations, role playing, etc.)? Are the primary sources best used in individual, small group, or class activities? How much time must I allocate for this primary source activity or project? What output(s) will this primary source activity or project generate? Will the activity or project be assessed quantitatively, qualitatively, or both?